Overclocking: Overclock CPU/PCI frequency for optimal system performance. Voltage Control: Voltage adjustment for CPU, DRAM, VTT, NB and SB to enhance compatibility and the boost overclocking. Hardware Monitor: shows the major readings of your system. System Health: checks temperature of CPU and MB, and adjust CPU Quiet Fan. "Auto apply when program starts": If you check this button, it will save your settings when you close OC Tuner window. And next time when you run OC Tuner, it will start with the settings you made. If you do not check this button, next time when you run OC tuner, it will start with the default settings. Note: Before you select "Auto apply when program starts", it is recommended to run some test programs to make sure your system is running very stably. 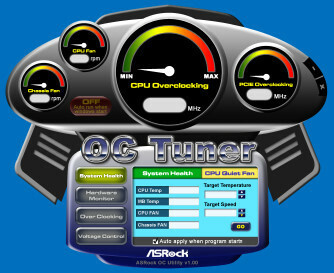 "Auto run when Windows starts": If you click this button, every time you turn on your system and enter Windows, the system will automatically start the OC Tuner. Note: It is not recommended to overclock your system. Overclocking and over-voltage may affect your system stability, or even cause damage to your MB or devices. It should be done at your own risk and expense. ASRock is not responsible for possible damage caused by overclocking and and over-voltage. Note: If system hangs after overclocking, please remove AC power cord and plug AC power cord again before you power on your system. 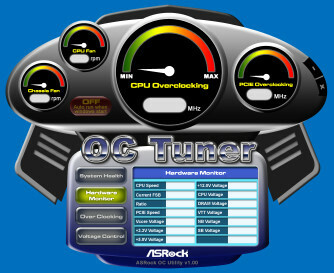 In the Overclock section, there are CPU and PCIE chapters for parameter settings adjustment in pursuit of optimal system performance. Under the CPU chapter, you are able to fine-tune the CPU frequency and CPU ratio by clicking the "Up/Down" arrows at the display panel. After confirmation of the settings, please click on the "Go" button. Under the PCIE chapter, you are able to adjust the PCIE Frequency by clicking on the "Up/Down" arrows and press "Go" for confirmation. In the Voltage Control section, there are many voltage adjustment items, such as CPU, DRAM, VTT, NB and SB items. The voltage control is relevant to overclocking. You may adjust respective voltages by clicking the "Up/Down" arrows and confirm by "Go" respectively. In the Hardware Monitor section, it shows the major readings of your system. There are CPU speed, Current FSB, Ratio, PCIE Speed and respective voltages. In the System Health section, there are two major chapters: System Health and CPU Quiet Fan. Under the System Health chapter, it shows the major readings of CPU and MB Temperature, and CPU and Chassis Fan speed. You may find out if there’s any abnormal situation occurs to your system’s temperature. Under the CPU Quiet Fan chapter, the Target Temperature and Target Speed will show the default settings of your system. You are able to adjust the setting too by clicking the "Up/Down" arrows and confirm by "Go" afterward. Note: ASRock OC Tuner is tailored for specific model, so please do not download OC Tuner from any other models' download site.